Who do you love? YOU! Who out there used to watch Saturday Night Live back in the 1990s, when they had the “Daily Affirmation With Stuart Smalley” skits? Maybe I am dating myself by admitting this, but I was a big fan of SNL back in those days, and the Stuart Smalley skits were some of my favorites. Those skits resonated with SO many people. 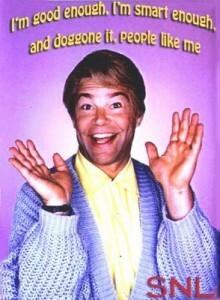 I can’t tell you how many times over the years I’ve heard people mimic Stuart Smalley, and it always brings a smile to my face when I see or hear someone imitating him. This month, I’ve been focusing on bhakti with my yoga classes. Bhakti translates to spiritual or divine love. However, I chose to spend time in class focusing on self-love for the majority of the month. After all, how can we expect to properly love the Divine if we can’t even love ourselves? And how can we love others if we don’t love ourselves? How can we truly find happiness if we don’t love ourselves? I truly believe learning to like and love ourselves is where we must start, and so that’s where I chose to spend the focus in class. Why do so many of us feel this way about ourselves? I wish I had a good answer to that question, but I don’t. Somehow, some way, our society has conditioned us to always be on the lookout for the next best thing that will bring us closer to perfection. But guess what? We’re already perfect! Spending time on your mat is a great way to begin to see that. When you step on your mat, you’re forced to focus on the present moment, and you are encouraged (or at least, I sure hope your teachers are encouraging you) to be OK with whatever shape your body is able to achieve, as long as it’s safe and feels good. My time on the mat all these years has certainly allowed me to see that I am perfect just as I am in every pose, even if I have to modify like crazy! And you know what? I can honestly say, without a doubt, that I love myself. Now don’t get me wrong. Occasionally, I still find myself having a pity party for some reason or other. I’m human, after all. When I see a yogi or yogini in a pose that is not possible for me, I sometimes beat myself up, wondering why I can’t look like that. And when I go clothes shopping, I get so frustrated because of the weight I gained from the steroids I was on, and I pick apart my body because of how squishy and plump I’ve become. But you know, others don’t seem to see me the same way I see myself. When I’ve beat myself up over a pose not looking like I think it should, I’ve had teachers or other students tell me how graceful or peaceful I look, and that they wish they could look like that. Hmmm…. So my dear readers, I urge you to really think about how you feel about yourself. And if you can’t say you love yourself, then ask yourself, “WHY?” What is it that is so bad that you can’t say you love yourself? My guess is, if you really dig deep, you’ll see that you are perfect and pure and love…right here…right now. Love who you are RIGHT NOW. You’re good enough, you’re smart enough, and doggone it, people like you!